In this project, different numerical and analysis tools are developed regarding cardiac electro- physiology and tension development (see also www.ibt.kit.edu/acCELLerate.php). 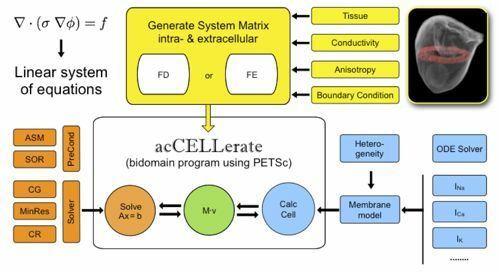 The simulation tools reach from single cell electrophysiology and tension development up to whole heart simulations including the body surface potentials. Furthermore, parameter identification procedures have been developed in order to adjust the parameters of the models to fit measurement data. All these methods are implemented modularly and efficiently using parallelization strategies. The analysis tools are capable to extract information from single data sources like the transmembrane voltage or 3D data like the action potential duration distribution across a whole heart. Furthermore different programs to identify predisposition factors for arrhythmias have been developed. to run on GPU architectures in near future. This will allow building a high-through-put procedure to test the arrhythmogenic effects of new drugs in an early development stage by using computational models of human myocytes.